Capsule Summary: With Margaret away, Frank becomes even more insufferable so Colonel Potter begs Hawkeye and B.J. to be nice to him. It’s too bad the “friendship” between Frank, Hawkeye, and B.J. 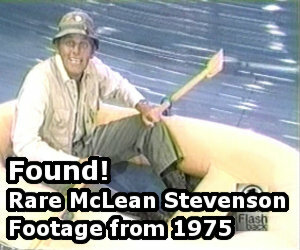 that sort of developed in this episode wasn’t real and didn’t resurface in later episodes. It would have helped shake up the series and introduced so many possible angles for storylines. Perhaps had someone actually befriended Frank, the character would have evolved enough that Larry Linville wouldn’t have wanted to leave. But of course the status quo must be maintained by the end of the episode so everything goes back to normal. It didn’t help that even Frank at his friendliest was unbearable to be around. There’s really just the one story in this episode but it has various strands. There’s the poker game, which is probably the highlight of the episode, and later Frank’s exuberant dancing and eventual collapse in the Officers’ Club. How did he manage to win at the slot machine when he never put in any money? Whoever was playing beforehand was probably pretty upset when they found out they left a coin in the machine and Frank won (although he didn’t have time to collect before he passed out). It’s telling that Hawkeye and B.J. pulled the toe tag prank on Frank. They just can’t be nice to him. They can force it when they’re sober but while drunk their true natures are revealed, although in their defense it was Frank who got himself into the ambulance, not the toe tag. Had he made it back to the Swamp and slept off his hangover, he probably would have woken up to the tag and been upset but that would have been that. Frank is very, very drunk. The title of this episode is German for “the day” and is an obvious pun relating to Frank’s toe tag. According to Larry Gelbart in a January 2004 post to the alt.tv.mash newsgroup, “Der Tag” was used by the Nazis as “some sort of militaristic slogan.” One could also argue that it refers to the single day when Frank was friends with Hawkeye and B.J. Although fans have suggested that this episode hinted at the eventual breakup of Margaret and Frank, Gelbart insisted in an August 1999 post that the tag scene with its “trouble in paradise” comment was just a joke and not foreshadowing. Radar’s comic book is an anachronism. Marvel’s The Avengers was first published in 1963, long after the Korean War ended. Also, the issue switches from #72 to #60. 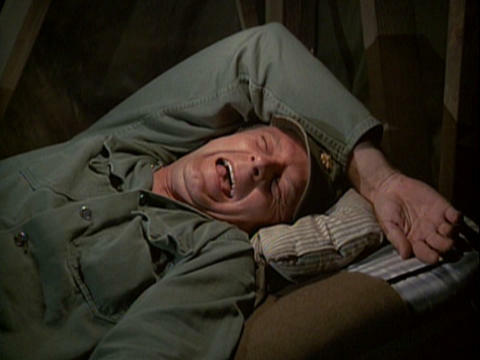 See Anachronisms on M*A*S*H for more information. There’s a PA announcement in the OR about Ralph Kiner hitting his 47th home run of the season. He only hit 47 home runs once, during the 1950 season, and the 47th was hit during a game on September 27th, 1950. See Baseball-Reference.com for details. Radar mentions a padlock on Margaret’s door but when she returns from Tokyo there’s no padlock to be seen. Was Frank’s infatuation with Nurse Kelly, who he calls a “hotsy-totsy,” referenced in any other episodes? I’d say this is another fairly average episode: it’s amusing when it needs to be (mostly involving Frank in his drunken stupor), but there’s also some slight seriousness thrown in as well, such as B.J.’s first outing to an aid station. When they return from the aid station, notice as Hawkeye and B.J. are carrying Frank back into the Swamp there’s a huge rip in the canvas backdrop in the background. Also, I do believe this was the first time we heard what would become Frank’s signature cackling laugh, which is always funny. This is one of my favorite episodes. In fact, it just may make my top 10. No matter how many times I see it, I find myself laughing. IMO a purely entertaining episode from start to finish. I could go on and on; there’s a ton of great lines in this episode! As far as I’m concerned, this is a great example of M*A*S*H during its peak period, running on all cylinders. I can’t manage to get a good solid still of it, but I’m pretty sure BJs package of Fig Newtons is 70s era design. I liked Franks drunken mispronoution of ‘war bond’ as ‘more fun’. One question – why does Frank or any of the Swamprats have toe tags stored with their gear?